Although there is plenty to do in lovely Fez, you can, if so wish, easily depart it for the afternoon for less than the price of a coffee and a cake at home. Morocco has a very good train system network and some impressive, quite grand, stations. You can live with the odd delay when you know you can get a first class ticket from Fez to Meknes in a private carriage for four pounds return! It’s a seven hour slog on the train from Marrakesh to Fez but a jaunty thirty minutes from Fez to Meknes. Volubilis has the most important and best preserved roman city remains in Morocco and is another site that I’d like to see upon a return visit when time allows. We ended up – you guessed it, in the market again. Meknes market is not so big as the one in the Fez Medina but it is cheaper and you get less hassle. The spice and food market is first class, with towers of multi coloured Olives soaked in lemon, meat, fish and spices. I wasn’t so keen on the upside down cow’s heads with their tongues hanging out, but the piles of colourful spices and vegetables are always a draw and it always seems a shame that they aren’t much use to you on holiday. My kitchen cupboards at home are full of interesting packets of dried spices, herbs, teas and other unidentified food accoutrements from around the world. You are sure they will be fab for adding to your next creative cookery session but somehow, it never quite happens. Back in our lovely tiled Riad in the centre of the Medina we surveyed our plunder. Pots, boxes, scarves rings, tagines and carpets were all going to present a bit of packing challenge, but one to which I was easily equal. A riad incidentally (Arabic: رياض‎) is a traditional Moroccan house or palace with an interior garden or courtyard and the word riad comes from the Arabian term for garden, “ryad”. The rooms were all arranged around the courtyard with ornate interiors and stained glass windows and there was a roof top terrace which gave a good view out over the whole of the crazy Medina. 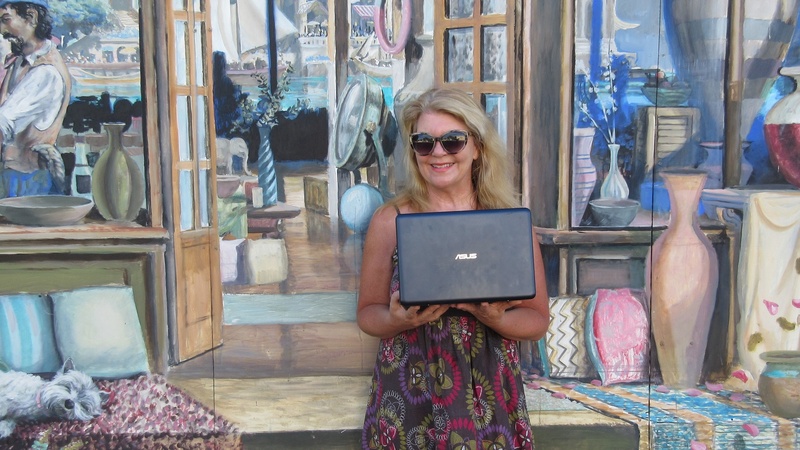 More authentic than a Western style hotel, but don’t expect sky TV or a mini bar – although they did have Wi Fi. The last place I wanted to visit in the Fez Medina was the famous Chouara tanneries where you can still see leather goods being made in an ancient and traditional way. Wedged among the ancient buildings and serpentine passageways at the bottom of the Medina is a grid of stone wells, each filled with a different coloured dye. This is an 11th-century tannery that still operates as it did a thousand years ago. Cow, sheep, goat, and camel hides are brought here to be preserved, dyed, and turned into the handbags, jackets, and wallets sold in the surrounding souks. The process begins with the raw skins being soaked in a mixture of cow urine, pigeon faeces, quicklime, salt, and water—the liquid in the white wells. This loosens the hair from the hides and makes them softer. After a few days of steeping in this concoction, the skins are hauled out and hung from rails on the balconies to dry. Then comes the dyeing. 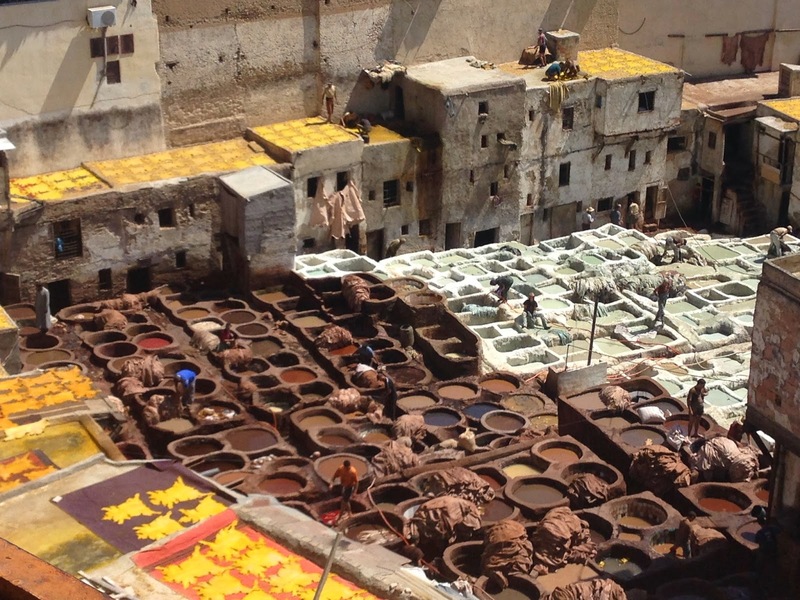 Tannery workers plunge the skins into the coloured wells, leaving them there for a few more days to absorb each hue. The dyes all come from natural substances, such as indigo, henna, saffron, poppies, and pomegranates. Due to the dead animal hides and the pigeon pooh, the tanneries are a bit of a stinky place and you are given a small spring of mint to hold under your nose which I have to say is fairly ineffective. You can’t actually go down into the tanneries where the workers are toiling away in their toxic workplace, but you view them from a nearby shop above. Naturally the shop then takes the opportunity to hard sell to the hapless captive tourist. Moroccan leather is very high quality, and still a fraction of what you’d pay for such fine skins at home. I got a divine purple goatskin hand bag which I will adore for ever and some baby soft camel leather pumps. I am good at bargaining and could have got them cheaper I know, but it depends on how much energy you want to put in to saving a few quid. Morocco is a magical place, it’s quite a large country and there’s such a lot to see and do that it has to be on my repeat destination list. Next time – the mountains!